Thermal, tape binding machine. 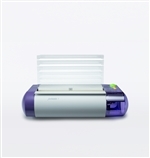 Binds up to 250 sheets (500 pages) in 40 seconds with the touch of a button. Tape binding machines use a heating process to bind documents with a strip of book binding tape. The AccuBind™ machine from Standard uses advanced thermal adhesive binding technology to create a linen cloth bind that is durable and attractive.